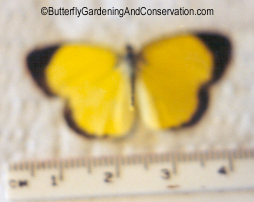 Adult Little Sulfur with wings open. 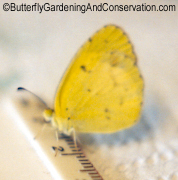 The Little Sulfur is a small yellow butterfly with a wingspan of around 4 cm or so. They can be found almost all year in the south eastern US and migrate to most of the east and somewhat to the west in the summer. Host plants include Cassia fasciculata (Partridge Pea), occidentalis and nicitans and Senna/Cassia marilandica (Wild Senna). 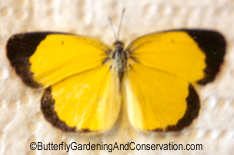 Their eggs are light green and laid singly on the upper side of the host plants. This picture is out of focus, but I thought it might still be of interest because of the ruler to help with the size perspective.